Gone With the Wind was written by Margaret Mitchell in 1936. At over one-thousand pages, it won the Pulitzer Prize and has sold over thirty-million copies world-wide. Gone With the Wind, the film, was produced in 1939 and is considered one of the most beloved, enduring popular films of all time. The famous movie, shot in three-strip Technicolor, is cinema’s greatest star-studded, historical epic film of the Old South during wartime that boasts a cast in a timeless, classic tale of a love-hate romance. When a highly recognizable hat worn by Scarlett O’Hara in Gone With the Wind ends up in Christine McAllister’s vintage clothing boutique off West Sunset by mistake, her efforts to return it to its owner takes readers on a journey to the past. In Susan Meissner’s novel, STARS OVER SUNSET BOULEVARD (NAL), it’s 1938 and Violet Mayfield sets out to reinvent herself in Los Angeles after her dreams back home of becoming a wife and mother fall apart. In Hollywood, she lands a job on the film-set of Gone With the Wind and there, she meets Audrey Duvall, a once-rising silent film star who is also in the secretary pool. Audrey’s zest for life matches Violet’s and their adventures together in Hollywood’s glitterati, have them up at all hours, until each woman’s deepest desires collide. What Audrey and Violet are willing to risk, for themselves and for each other, in pursuit of their own happy endings will shape their friendship, lives and the futures of friends far into the future. Susan Meissner weaves a wonderful narrative during a time in history when Hollywood was transitioning from silent films to the talkies and TV, people took time to dress well before they left their homes, drinking was an art-form and anything was possible! Meissner’s novel takes readers back and forth in time, while the famous hat is a compelling character grounding the story throughout. Thanks to NAL publishers and Susan Meissner, we have one copy of STARS OVER SUNSET BOULEVARD to give away to one lucky winner. Just leave a comment telling us which character is your favorite one from Gone With the Wind? We’ll pick a winner Friday. 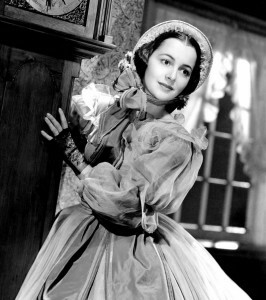 I found this delightful interview with Olivia de Havilland, the only remaining living actor from the cast of Gone With the Wind on Susan Meissner’s blog. I think you may enjoy it. Ms. de Havilland, who was born to British parents in Tokyo, Japan, will celebrate her 100th birthday on July 1 of this year. She is the only major star of Gone with the Wind still with us. This interview, which was published just a few months ago, offers us a candid look into what it was like to be a part of the most iconic movie ever made. It was my pleasure to spend quite a bit of time with Melanie and Scarlett this past year as I wrote Stars Over Sunset Boulevard, my latest book about two studio secretaries who become best friends on the 1939 movie set of GWTW. Melanie is as deeply complex as character as Scarlett. You don’t appreciate how much until you truly study Melanie as a literary figure. Olivia de Havilland played her perfectly. I have a confession to make. I have been a reader since pre-kindergarten and I am now retired. I read a lot. I have never read Gone With the Wind, although I own it in hardcover and it sits on my shelf. I have never seen the movie either. I have accumulated some knowledge of the story over the years because……….Gone With the Wind. I can see the way you’re looking at me, you know. My favorite character is Melanie Wilkes. I loved her acting. Favorite character was Rhett Butler. I so much want to win this new book. Thanks for this chance. I just read GWTW this year! I’m from Atlanta and have always loved Civil War era books. And GWTW is just as wonderful as everyone has said. (I don’t know why it took me so long to read!) what I loved most about it is that each and every character was so full and rich–from the random slave to Tara and Atlanta! So, my favorite character? Rhett, of course! An original bad boy with a heart of gold. I’m not much of a GWTW fan (sorry!!!) but Scarlett was fun to watch the one time I ever saw it. It’s hard to pick just one but if I had to it might actually be Rhett! Rhett is always fun to watch/read!